Raw Materials | Cover Story | Style Weekly - Richmond, VA local news, arts, and events. A new craft workshop is drawing women to Stony Point Fashion Park to create their own holiday gifts. Scott Elmquist Rebecca Keeling Gagnon stands in her experiential retail shop, AR Workshop, at Stony Point Fashion Park. 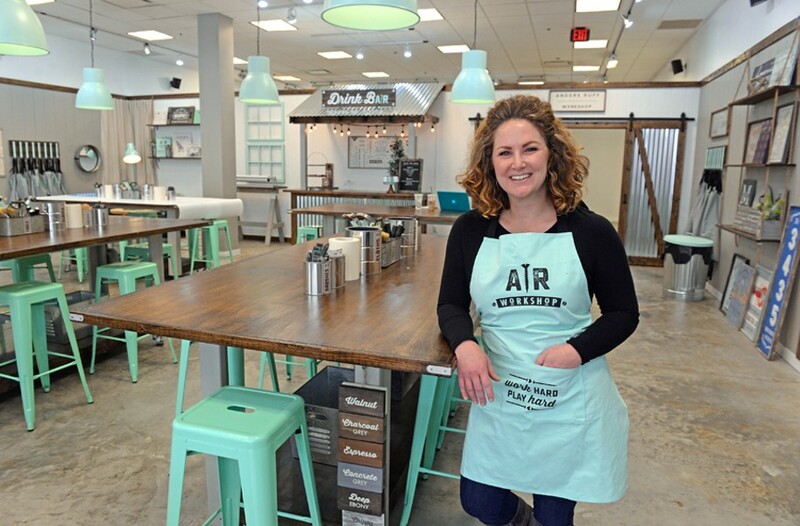 Rebecca Keeling Gagnon, the owner of the experiential retail shop AR Workshop in Stony Point Fashion Park, likes it when women feel empowered. The shop, which opened in early October, is one of more than a hundred new franchises across the country since the flagship location opened in Pineville, North Carolina, in 2016. Even before the retail shop opened, hundreds of Richmond-area women had signed up for classes taught through the end of the year. The Richmond calendar has a class nearly every day, sometimes two a day. Participants can pick up power tools and create wooden plank signs, framed signs, canvas pillows, round signs, trays, Lazy Susans, centerpiece boxes and canvas tote bags. "A lot of people, especially women, don't get a chance to pick up a nail gun or a sander and use it for a project," Gagnon says, who notes that it's not just about creating a piece of art to take home, it's about "boosting confidence and feeling empowered." Before this, Gagnon spent 11 years as a wedding photographer. She decided to bring the concept to Richmond after attending a class in Alexandria. "You can walk in and start with raw materials that look like a pile of wood and walk out with something you made with your own two hands and actually use in your home," she says. Working with wood wasn't totally unfamiliar for her. Gagnon had grown up around sawdust — her father was a boat builder. Though she's comfortable with tools and cutting wood, not everyone who signs up for classes is. Take Leann Harris. "I work in IT by day," Harris says. "It seemed achievable for someone who doesn't self-identify as a creative." Harris had done enough painting classes, she says. She wanted to come home with something more practical that she could use. She's already signed up for November classes with her friends. Many of the November classes feature holiday designs, but participants can request custom designs and stencils before the class during registration. The paints are nontoxic. The projects, the workshop decor, the instructor outfits and even the retail shop all stick to an industrial farmhouse aesthetic. It's just in time for the holidays. "The majority of my family will be getting handmade gifts this year from the workshop," says Karen Alley, marketing director of Stony Point Fashion Park. She says AR Workshop is the kind of experience-based retail consumers are looking for lately. Stony Point continues to develop the property to create more of a parklike feel and recruit businesses like a coming escape room and Utopia Med Spa. AR Workshop is in Stony Point Fashion Park’s Suite 192-A. Register for classes at arworkshop.com/Richmond.